A few years ago I attended my first Vancouver Alternative Fashion Week (VALT). The show that literally had me flying out of my seat afterward to meet the designer was that of Steampunk Jewellery Designer Carolyn Bruce. I snagged her at the media wall where they were snapping photos of her collection on the models to share my adoration and heard that someone visiting from Toronto had bought a piece of hers right off the runway. No surprise. We connected through Facebook and during the very next Vancouver Fashion Week (VFW), I picked up a fabulous, big, in-your-face statement necklace on my way to the event to wear that day. It was a hit. I wore it a few weeks later to a Holt Renfrew event and had people crossing the room to get a closer look and to ask who the designer was. Each season I see more and more people at events wearing her jewellery and it brings a smile to my face to know I was one of her early fans. I now proudly own three of her necklaces, three pair of earrings, and have given her steampunk bookmarks and tea infusers as gifts often. Bruce's star has been rising, with constant requests to show her pieces at event after event. This last weekend she took to the stage at Eco Fashion Week (EFW) and in true Bruce fashion stepped it up to create entirely new pieces. This collection was designed around up-cycled purses and bags from thrift stores which were embellished to coordinate with the jewellery. The unique purses had been acquired here and there by the designer over the last two years and she shared, "I don't know why they 'spoke' to me, but they were the inspiration for the entire collection." Parts and pieces included in the necklace were reused items gleaned from thrift stores around the world including rosewood carved faces from Bali. Vintage shoe toppers were turned into epaulets. Almost all the shoes, boots and dresses were from the thrift shops with just a few exceptions. "Thrifting does not mean cheap and nasty cast offs ready for the dump. High fashion chic items can be designed from thrift stores offerings...TRASH TO TREASURES." These runway pictures by Peter Jensen really bring home how gifted Bruce is, offering a wonderful showcase of her incredible talent. 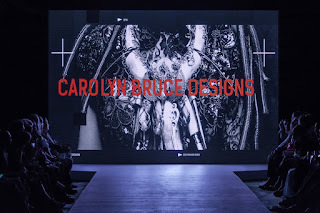 You should check out the fabulous interview I did with the designer called Carolyn Bruce - Inspiration is Everywhere, In it she shares about her journey to this moment and where she finds inspiration. And for those who want to know more, I have included the press release below. Who would have thought nearing her 6th decade in life that local Steampunk, One-of-a-Kind Wearable Art Jewelry Designer Carolyn Bruce would have her career sights set on New York and LA 2016. Wife and mother of two girls, you would think at this point she would be settling down and retiring. But not this driven Maverick. In her earlier life, before becoming a wife and mother, she was in industrial design, interior design and graphics. Ever the engineering mind, she won the New Zealand Young Woman of the Year, “Zonta Award” for designing an inflatable rescue stretcher. She grew up in an architectural environment with her father as successful architect and she figures that’s where her spatial and engineering mind was developed. She has a fascination for how things are put together in an interesting and definitely unique kind of way. Recently her works have been in one or another high-fashion fashion shoots on a weekly basis, been published in magazines, she’s dressed actors and celebrities for their award galas, draped her jewelry on VIP’s for their charity events, she’s made custom pieces for several singers, many of her pieces were seen worn at the Diner En Blanc Vancouver event, and she fully decked out one of Vancouver’s top Fashion Bloggers and Stylists who attended almost 60 VIP parties at NEW York Fashion Week 2015. One of her goals for 2016 is to meet 94 year old legendary fashion icon Iris Apfel who lives and still teaches fashion in New York. At this pace we believe it’s in her cards. And that’s just the tip of the iceberg. 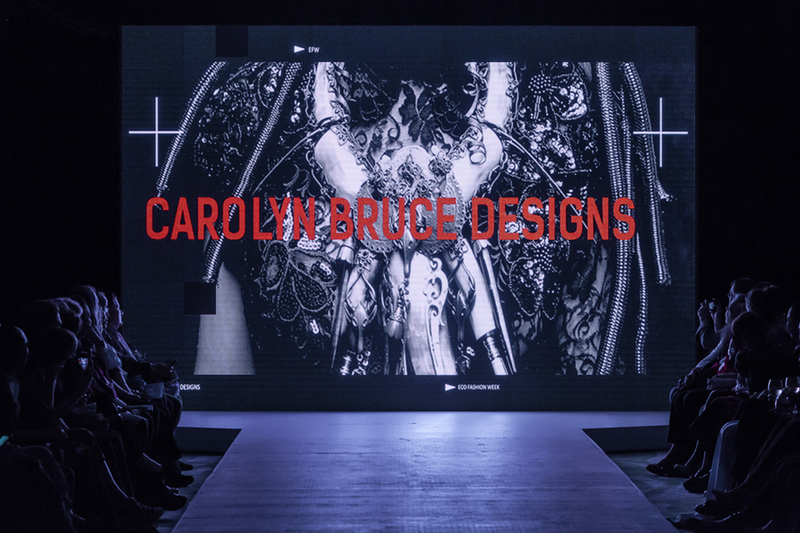 The creative visions for Carolyn Bruce Designs literally flows out of her. She says, so much so that in one night it feels like 50 designs will download all at once and she begins to feverishly pull all the pieces together to create each story as it organically unfolds in front her. Some of her pieces come together in hours others take months to complete, like a lot of artists who paint many pieces at one time. Her designing starts out very early in the morning, most times at 4am when the house is quiet and all others are nestled in their beds. It is then the flood of creativity begins to flow and her amazing One-of-a -Kind pieces are born. Some of the more notable events Carolyn has been involved with in the past year since the launching of her website CarolynBruceDesigns.com May 1st in tandem with Art World Expo 2015 at Science World are: STRUT Vancouver Foundation of Hope’s first annual community fundraiser, the Re:Semblance exhibition at the Ferry Building Gallery in West Van, A Space In Time Exhibition at the Port Moody Arts Centre, Bikes Against Bullies Annual Fundraiser, Brilliant, headed by Dean Thullner for the annual Fundraising Extravaganza for St. Paul’s Hospital Foundation, the VCON Art Show & Convention, Christmas at Hycroft Manor, VALT 2015 Vancouver Alternative Arts & Fashion Week to be held at the Chinese Cultural Centre this year and the 5th Annual Gifts Galore Christmas Craft Fair which she produces herself showcasing other locally based artisans. Look to the Stars, that’s where you will see Carolyn Bruce Designs gracing the Red Carpet on the necks of Celebrities and Rock Stars in the very near future.